All that talk about geothermal heat pump systems around you might have inspired to have one in your home. But you don’t know that right information about the system to be planted. 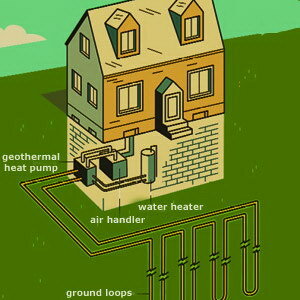 There are different types of geothermal systems. Depending on the circumstances, many types are available. Geothermal systems are effective due to their limitless energy supply and less effective costs. They are now planted on domestic and industrial levels both. 3. Cost of initial implantation. 4. The space or area available for the system. So these factors manage the choice of suitable type. They are more suitable for hot places as the magma from the hot region is not far away and heat can be derived easily. But they can also be implanted in areas having little colder regions. Vertical system : As the name suggests these systems occupy less space but are larger in length and are buried deep down into the ground. They are used for multistory housing complexes and for large commercial building. They are more pricy. Horizontal system ; They occupy more space in width than the vertical systems but are less buried underground. They are most cost effective. It should be made sure that enough space is available for their installation. In suburban installation they are the most viable systems. 2. Pond or lake system : This system has a water source near its installation. The underground pipes run from the building to the water body. The pipes are in the form of concentric coils so that the water does not freeze. 3. Open loop system : This system needs a continuous supply of clean water which can be harnessed to absorb heat from the water below the earth. So water bodies are used for heat exchange between the fluids. 4. Direct exchange : Instead of exchanging heat by circulation, the direct exchange has a single loop refrigerant which has direct contact with the ground. So it is very important to get the accurate system installed whether in industries or at homes. If you would have had right system installed it will serve as the energy saver and will assist you monetarily. You can visit geothermal centers that would assist you in choosing the right system. An expert should be hired to make the installations possible. You can also search online; many centers have backup websites which can help you through this. So choosing the right type of geothermal system is very important. You can hire an expert or get information from any online source which would assist you. Knowledge about geothermal systems is very important as it is a large scale production.